When it comes to making vegetables quickly, roasting them in the oven is one of the easiest (and tastiest) ways to get them on the table. Although you might think of root veggies, like sweet potatoes and squash, when roasted veggies come to mind, we’ve really fallen in love with roasted broccoli lately. It’s truly an easy and delicious way to prepare broccoli. If you enjoy Brussels sprouts as much as we do, then add them into the mix too! Broccoli and Brussels sprouts are members of the cruciferous vegetable family, which we highly encourage you to incorporate into your diet every day. You can also try cauliflower, bok choy, cabbage (all the different types), and leafy greens such as kale and collards, which are all members of the cruciferous family. These veggies are high in glucosinolates, which are a type of phytonutrient that are studied for their role in lowering cancer risk. Plus, they are rich in vitamin K, which is an important nutrient for regulating the inflammatory response in the body. To make this roasted dish, we recommend using avocado oil because it’s safe to use at high temperatures. 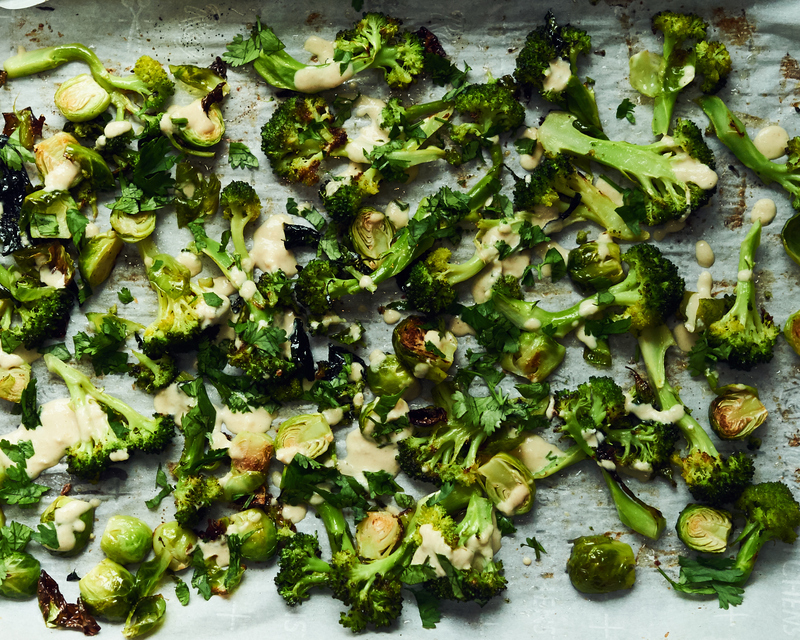 You can enjoy these roasted veggies on their own if you don’t have time to make the tahini drizzle, but we definitely recommend including the tahini and lemon for ultimate flavors! Chop the broccoli and Brussels sprouts. Spread out on a baking sheet lined with parchment paper. Toss the veggies with a drizzle of avocado oil, garlic powder, sea salt and pepper. Roast for 20 minutes, until the veggies begin to crisp slightly on the edges and are bright green.